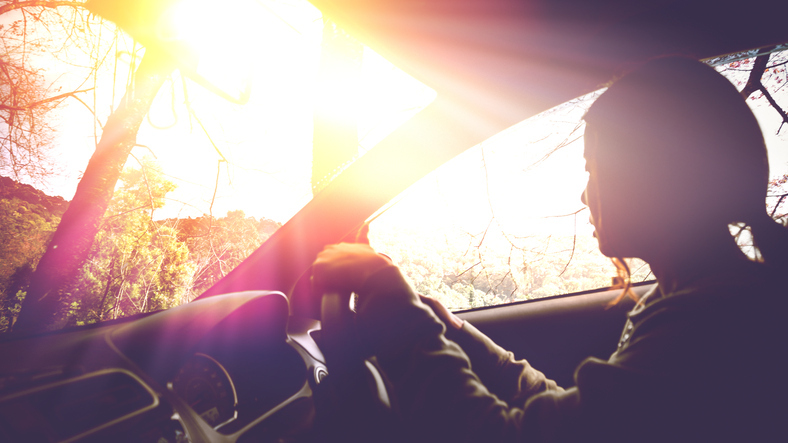 Sometimes the sun can dazzle you when you're driving. Literally, to dazzle means ‘to blind temporarily with a very bright light’ and, of lights or anything that sparkles, ‘to shine brightly.’ Figuratively, to dazzle means ‘to impress deeply’ or ‘to excite admiration.’ As a noun, dazzle is something that dazzles or an act or instance of dazzling. The lights of the oncoming car dazzled me. The gemstones in the necklace dazzled under the bright lights. The movie star's fans were dazzled by her fame. The splendor of the surroundings dazzles. The young man left his home in the countryside, attracted by the dazzle of the big city. The dazzle of the sunlight on the surface of the lake was beautiful. Dazzle camouflage was a type of camouflage used on ships in the First and Second World Wars. Unlike most camouflage, dazzle camouflage was not intended to make the ships difficult to see, but to make it difficult to estimate the speed the ship was moving at and the direction it was heading in. You can read more about dazzle camouflage here. Dazzle dates back to the late 15th century. The verb is formed by adding the suffix -le (a frequentative) to the verb daze. Daze, meaning ‘to be stunned’ or ‘to stun or bewilder,’ dates back to the late 14th century, as the Middle English verb dasen. Its origin is uncertain, though some linguists believe it came into English from the Old Norse dasa, ‘to make weary‘ (found only in the related verb dasask, ‘to become weary’), while others think it may have come from the Middle Dutch dasen (to act silly). Another theory is that it came from the Icelandic dasask (to make weary with cold), which came from the Old Norse word. This theory is supported by the fact that ‘to make weary with cold’ was one of the original meanings of daze in English. Dazzle originally meant ‘to be stupefied or confused,’ but the sense shifted towards the transitive ‘to overpower with strong light’ in the early 16th century, and the figurative sense ‘to overpower or cause admiration due to brilliancy or showy display’ in the mid-16th century. The noun, meaning ‘brightness’ or ‘splendor,’ comes from the verb and dates back to the mid-17th century. Razzle-dazzle dates back to the late 19th century, as US slang.